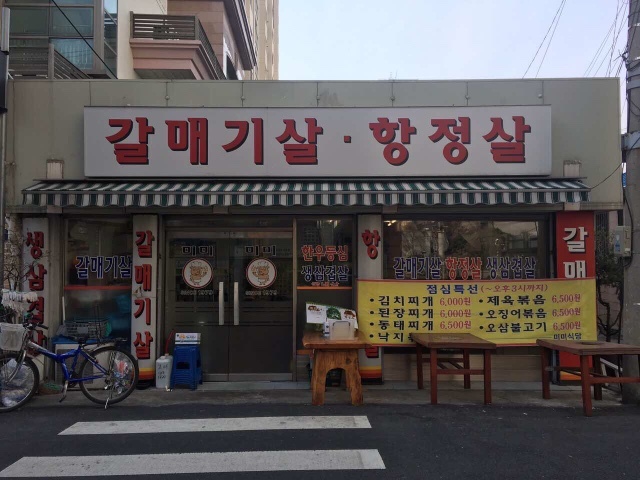 Looking for a place to eat in Jegi-dong, Seoul is not as easy as compared to other (touristy) areas. There are not much *pictures* that show you images of food that imply that certain places are restaurants. We knew it was going to be a tough first night. I say night because we had lunch inside a mall that had restaurants on a certain floor. Hihi.. So, on our first night - the kids were already tired and sleepy. So, my Panget and I just bought them fried chicken from a nearby chicken restaurant place and instant microwavable rice from 7/11 to eat in our Airbnb apartment. We opted try our luck - so we walked and searched for those exhaust tubes from the ceiling that we can see from the outside. We were also quite tired and after much walking, we decided to try our luck in a small restaurant we felt was good because it was almost full of diners. When we got inside, there was no English menu to be found. We saw though that diners were grilling meats! We thought, we can do the *turo turo* system. But then I made the mistake of saying *Samgyupsal* to the elder man who was in charge, let's call him Angkong. His eyes lit up and started to serve us the Korean side dishes. My Panget and I waited and then in a few minutes, the raw pork belly slices were served us for grilling. My Panget looked at me mentioned it wasn't the same type of meat at the ones we saw on the tables beside us. I told him, I told Angkong - samgyupsal, and it meant pork belly. I think my Panget was too hungry to argue and so I started cooking and him eating. The samgyupsal was really good. I was telling my Panget that am in awe of their pork because comparing them with those in Manila - they don't taste the same! I was assuming that the quality of pork was different in terms of standards and quality. But the meal was incomplete without rice. So I asked my Panget to look for the term rice in Korean and call Angkong's attention to order. Angkong looked at his cellphone and then suddenly pulled out of his pocket a small magnifying glass! Hahaha.. It was so adorable, really - and he looked closer and laughed! I asked my Panget why and he was also confused. Angkong then walked away. I asked my Panget if he got the correct term in Korean on his phone, he looked at me blankly and told me it's rice! Hahaha.. But I guess, Angkong got the message because in a few seconds - we were served rice in the Korean famous stainless bowls. After eating the Samgyupsal order, we still felt the meal was kulang. Maybe because we saw neighboring tables have the beef meat slices. So I tapped Angkong in the shoulder and pointed to the meat of the table beside us and help my finger to signify the number *1*. He looked confused but then the table beside us said something in Korean and when Angkong came back, he gave us an order of the sliced beef. So I grilled away and ate and ate. After eating, we told ourselves that at least now, we'd have a restaurant that we can go to that is nearby - you know, just in case we're too tired already. When Angkong saw us finished, he came to me at spoke in Korean with rice grains in his palm. I honestly didn't understand what he was trying to say - and then it occurred to me that maybe my Panget searched the wrong term for rice in Korean. Angkong then went back to me and typed a character in Korean in his phone and pointed to the rice. I then told my Panget, that maybe like in Tagalog - rice can mean two things - bigas and kanin. There was a big difference when you use the incorrect term, right? And I was right because when we got home, I tried googling - and indeed, my Panget showed Angkong the term for bigas! But at least now, I know what steamed rice is in Korean - it's BAP! Hahaha.. I learned something new! Because we were so hungry, I failed to take pictures of our meal. But believe me when I say that it was really really good! We came back - two more times. Hahaha!! The second time was with the kids in tow. Angkong was happy to welcome us! He was extra nice to us, I think he was smitten by Connor. He was smiling at him every so often and even gave the kids seaweeds to snack on! When we sat on the table, he already new what to give us to grill - Samgyupsal! Hahaha.. He kept on going to our table checking the heat and smiling at Connor. And then suddenly he took out his phone and it showed a picture of a little boy that looked similar to Connor! He them pointed to the picture and then at him. I can only assume that the little boy in the picture is his grandson and since he looked like Connor, Angkong was really smitten! Hahahaha.. I promised, I would write about him and his restaurant because we loved the food and his service is top notch. I wasn't again, able to take pictures of the food because well, we were too hungry already! But the second time was still very good. On our last day in Seoul, we didn't want to go far anymore. So we decided, what the heck - go back to this restaurant for our last lunch! Hahaha.. When we entered, it was so different from the two dinners that we had. They were serving stews! And they all looked fiery red. Yikes. I was telling my Panget, how we can order something different. But Angkong came to the rescue. 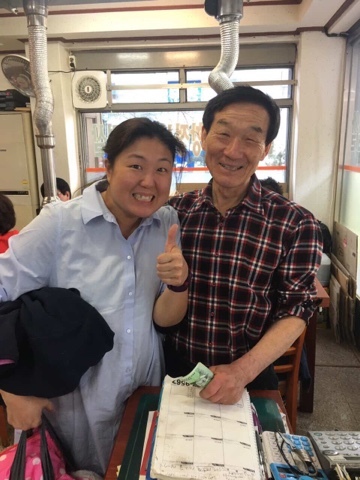 Each and every diner there was eating the stew, and we well I think since he was happy to see us back - served us Samgyupsal! Hahahaha.. We felt really special because Angkong went out of his way to arrange the charcoal grill and served us something that he didn't serve to others that lunch time! Hahaha..
Before we left, I made sure to take a picture with Angkong. I also told my Panget to take a picture of the facade of his restaurant. Isn't angkong cute? Hihi!! He reminds me of the angkong in the movie Up! If in case you find yourself in Jegidong (Herb Medicine area) or in Jegidong Station. This restaurant is nearby Exit 3. Go out of Exit 3 and just walk straight and turn right on the first street on your right - walk a few meters and it'll be on your right side. It's the only restaurant with those expandable exhaust hanging from the ceiling. The only english words you'll see is SINCE 1979! Hahah.. Good luck! Aww Didi!! Ajussi is so cute!! At natawa ko sa mistake sa rice! Hahaha!